This movie has a really good drug climax. A good drug climax is funnier and more complicated than a car chase climax - though it is less mobile. It's the people’s brains that are speeding ahead while their bodies lag behind with all the wrong gestures. Sometimes the struggle is in becoming (or pretending to be) comfortable or sane. When comfort and sanity are wildly out of reach, the struggle to have them or to emulate them is an understandable goal, but it is always a disastrous one. We watch the characters grasping for the best (and least humiliating) understanding of what is actually happening in a specific situation. There is often much stating aloud of obvious facts or important questions - a crucial act of basic communication between friends during perceptual confusion and emotional vulnerability. In Get Him to the Greek these communications come out like - “Why is Moby whipping us? !”, and - “Let’s go jogging.. Please! For our friendship”. Though this great climax is brief and glorious, “Get Him to the Greek” is a three day journey. It begins with a music company employee Aaron Green (played by Jonah Hill) going to England to retrieve Aldous Snow, a rock star (played by Russell Brand) who is in a slump. Green is to bring Snow back to Los Angeles so he can perform at a concert. The concert will mark the 10 year anniversary of Snow’s most celebrated rock concert that took place during his career peak. The CEO of the company Green works for is Sergio Roma (played by Sean Combs whose role in the drug climax was a drug movie triumph). Snow is the kind of artist who doesn’t sleep, is capable of a complicated intelligence, engages in kindly care-taking after drugs have been ingested, and, as much as he gets himself and his art right, also occasionally gets it wrong. The art he gets most wrong is a song and accompanying music video called “African Child”. We are shown the music video right in the beginning of the movie. The video involves Snow as a pale Christ figure dancing in an African village. The real life fears of art-making are taken here to their pleasurable extremes. Not only does the music video fail to save Africa, it fails to even entertain the masses, and it is described again and again by the media throughout the movie as one of the worst things to ever have happened to the continent. After this flop, discomfort ensues, the love of his life Jackie Q, who is also a rock star (played by Rose Byrne), splits, and Snow awakens a 7-year-sleeping-beast-of-a-drug problem. Green finds Snow in an apartment above the River Thames living with his mother and an assistant. Everyone is immediately irritated by Green, but things ease up a bit. The movie’s narrative suggests Snow’s great abuse of Green on the journey. 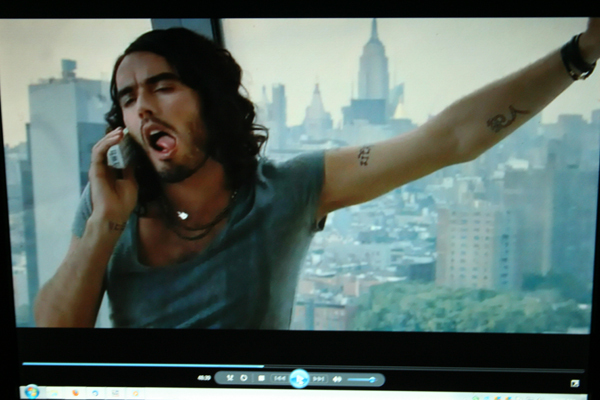 And though there are plenty of obvious sadistic aspects to Snow’s typically annoying rock star character, it is very difficult not to empathize with Russell Brand and his face. He seems to not have a line of self-pity in there. The less obvious sadistic traits of Snow’s character are surprisingly nuanced. They mostly come with Snow’s selective use of the word “selfish” – as in: “Don’t go to sleep now, it’d be selfish”, or the alternative “Let me go to sleep now, don’t be so selfish”. The absurdity of the grand drug climax works best if we have also been in touch with reality. We see it most clearly somewhere in the middle of the movie, in a brief scene where Snow calls his ex girlfriend, Jackie Q, early in the morning. In the shot, we see Green (the man there to guide and guard Snow against himself) passed out on the couch - slayed from a night of debauchery and perceptual confusion. Snow, not sleeping, is without a conscious keeper. “Are you alone?” Jackie Q asks Snow. “No” he answers, “I’m with some affable nitwit”. The scene is still quite silly, but it is also quiet and carries with it a slightly unpleasant consciousness and a deep longing for human connection. Here in this very small and undramatic moment, we all, all of us together, understand the very same stupid, painful, obvious, unavoidable thing.